Budget Accommodation Venice Italy? Children Enjoy, You can Relax. 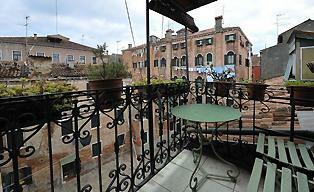 Looking for a budget accommodation Venice Italy? Perfect for a short family holiday near Venice. I will show you my Top 3 favorite campsites. These are complete resorts for a budget stay around Venice. On the coast near Venice, there are many campsites and resorts. Mobile homes, chalets and bungalows you can hire/rent for a couple of days or a few weeks! But you can also bring your tent, camper or caravan. 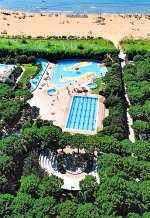 The location of UNION LIDO PARK & RESORT is on the Cavallino coastline. This location is a peninsula on the opposite of Venice towards the sea. A budget accommodation Venice Italy with about 1 km private beach! It has four stars, and it is modern and very well maintained. A water bus service will bring you from 'Punta di Sabbioni' to Venice and the islands in the lagoon. 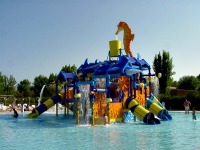 Campsite Marina di Venezia is a fantastic budget accommodation near Venice. The site is on the coastline of Cavallino and almost next to 'Union Lido.' It is an excellent resort with all the facilities you need on a 4-star holiday. And so close to Venice! The resort is spacious and integrated with nature. Use your tent, caravan or hire/rent a chalet or bungalow. There is plenty to do and regarding your budget… It is not expensive. A great way to have a better Venice Italy holiday…! The location of Campsite Fusina Tourist Village is at the mouth of the Brenta Canal. It's on the right side from the bridge (Via Della Liberta) which you have to cross to reach Venice. The campsite is one of the cheapest accommodations in Venice Italy. The water bus service takes you to the center of Venice in just 20 minutes. An ideal base for excursions to Venice, Lido, Riviera Del Brenta, Padova, and Treviso. This campsite has a restaurant, a supermarket, and a children's playground. All facilities and the accommodations are simple and plain. From here you can easily reach Venice, Burano, and Murano. Some campings have a shuttle bus to Punta Sabbioni for extra service to their customers. These transfers are perfect! The location of the two campings is on the same peninsula very close to each other. They differ only in price, facilities, ambiance, and luxury... It is up to you which accommodation you will choose by price, location or facilities. You've read about budget campsites in Venice Italy. There is plenty to explore as you see. Discover Venice on my site and get more information about this beautiful Italian city.